"In the title, the flutist Amy Porter likens the act of transcribing Bach’s Cello Suites to a translation. But her gleaming, lyrical reading of these profoundly personal works feels more like a distillation that concentrates and heightens their melodic structure." 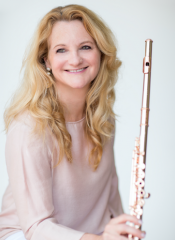 "ONE OF THE STRONGEST FLAUTISTS IN THE CURRENT MUSICAL WORLD"
sonority of the flute illuminates the contours of the music in a novel and refreshing way." "The Fourth Suite shows, as well as anything else here, how successful these transcriptions can be in the right hands. Porter’s adaptation seems completely natural, as if Bach had originally written it for flute." SARATOGA SPRINGS: Flutist Amy Porter gave a superb recital Saturday night at Skidmore Collegeís Zankel Music Center and showed that she's not only very versatile but that she can do everything well. She chose a program that tested every aspect of her playing from a Baroque sensibility to using the instrument as a vehicle of sound effects, and she met each challenge with passion, skill and much musicality. The concert was also stream lived, which allowed her many students and two of the composers whose work she played to "listen in." Porter, who teaches at the University of Michigan's School of Music, played with a big colorful sound, a very fleet, smooth technique, fabulously light double tonguing, effortless breath control and a forthright style of musicianship that was open, direct and had its own kind of exciting brio. Her pianist, Katie Leung, who was once a Porter flute student, provided exceptionally sympathetic support, matching nuances and excellent balances. They began with Poulenc's Sonata (1957), one of the most familiar works of the repertoire for its lyricism and line. The first movement was well nuanced with strong colors and a judicious use of vibrato. The slow second had a thrilling depth of expression with finished phrases and the finale was brilliant and playful. Porter's arrangement of Bach's Prelude from his solo Cello Suite No. 5 in C minor was done with great passion. Flutists don't have this type of piece in their libraries, so this arrangement is a welcome addition. It's very challenging and dramatic, but satisfying to perform. Christopher Caliendo has written several sonatas for Porter. "The Western Sonata" (2010) is vivacious, jaunty, jazzy and brilliantly conceived. Porter was at home with its shifting moods and technical and offbeat demands. Skidmore flute professor Jan Vinci joined Porter and Leung for Ian Clarke's "Maya" (2000). Working in close harmonies, they interwove and blended in a pretty piece that often sounded like a rippling stream. Heinz Holliger's "Sonate (In)solit(air)e" (1996) for solo flute is a tour-de-force for a flutist to make all kinds of sound effects over a three-octave range including multiphonics, whistles, blasts of sound, and key slaps. Despite the weirdness, the seven movements had continuity and a hip coolness that made the crowd smile. Porter played all this stuff so well. Porter and Leung finished with Daniel Dorff's "Sonata (Three Lakes)" (2014). The three movements had long flowing arched melodies in sunny colors, a light and spare piano part, and rippling technical passages. The duo played with great energy and finesse and got a standing ovation.